January 15th, 2015- 2014 was characterized for a reduction in the prices in the main European electricity markets. Except for the MIBEL market, where there were annual increases for the second and third quarters of 2014, in the other markets falls were registered during the four quarters if prices are compared with the same periods of 2013. One factor that led to this decline in prices, common to all markets, was the decrease in electricity demand in the respective countries compared to 2013, mainly due to increased temperatures, especially in the first half of the year. On the other hand, on May 13th of 2014, the coupling of the daily markets of the Southwest Europe (SWE) was held. Thus, regions of Southwester and Northwester Europe, SWE and NWE, respectively, began operating with a common system for calculating the price of electricity in the daily market, through the Price Coupling of Regions (PCR) mechanism. Sources: EPEX SPOT-Francia – EPEX SPOT, EPEX SPOT Phelix – EPEX SPOT, N2EX – NORD POOL SPOT, IPEX – GME, MIBEL – OMIE. Prices of the N2EX market are expressed in €/MWh and are calculated from original values in £/MWh. In 2014, MIBEL market behaviour, in Spain and Portugal, was consistent with the evolution of the thermal gap (amount of electricity to be produced by the generally more expensive thermal generation technologies, so that electricity demand is fully satisfied), the higher the thermal gap, the higher the price. The month with the lowest price of the year was February, 17.12 €/MWh for Spain and 15.39 €/MWh for Portugal, coinciding with the maximum monthly mean values of hydroelectric and wind power production of the year. The month with the highest price was September, with 58.89 €/MWh and 58.91 €/MWh for Spain and Portugal, respectively, where the minimum monthly average wind power production of the year and also low hydroelectric production output were recorded. Moreover, during 2014 there were fewer 0 €/MWh price hours than in 2013, all of them in the first quarter, 3.4% less in Spain and 3.2% less in Portugal. The average price in 2014 was 42.13 €/MWh for Spain and 41.86 €/MWh for Portugal, representing an annual fall of 2.13 €/MWh and 1.79 €/MWh for Spain and Portugal respectively. In the EPEX SPOT-France market, the day-ahead market price was 34.63 €/MWh in 2014, 8.61 €/MWh less than in 2013. In the second semester of the past year, the French market price fell 8.01 €/MWh compared to the same semester of 2013. In 2014 the price of 5.4% of the hours coincided with the MIBEL market price, with these hours mainly distributed in the last quarter; this fact is remarkable considering that until 2013 this percentage was at or below 0.1%. 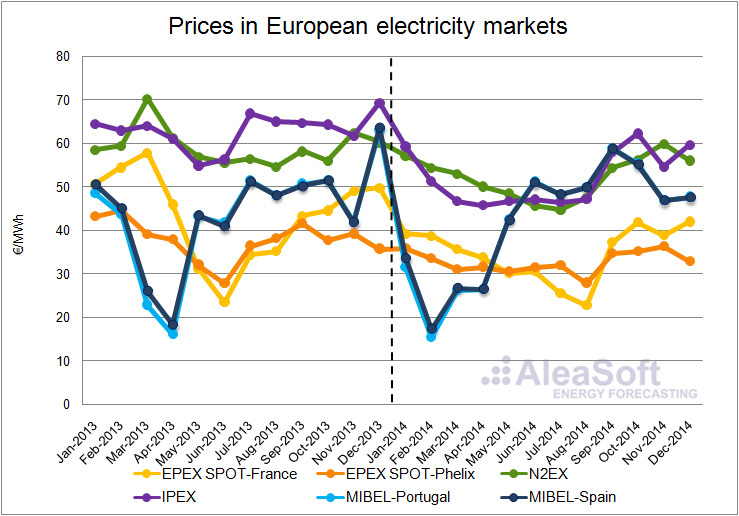 During 2014 the average monthly EPEX SPOT-Phelix market price, in Germany and Austria, remained stable between 30.50 €/MWh and 36.50 €/MWh, except in August that was 27.93 €/MWh. 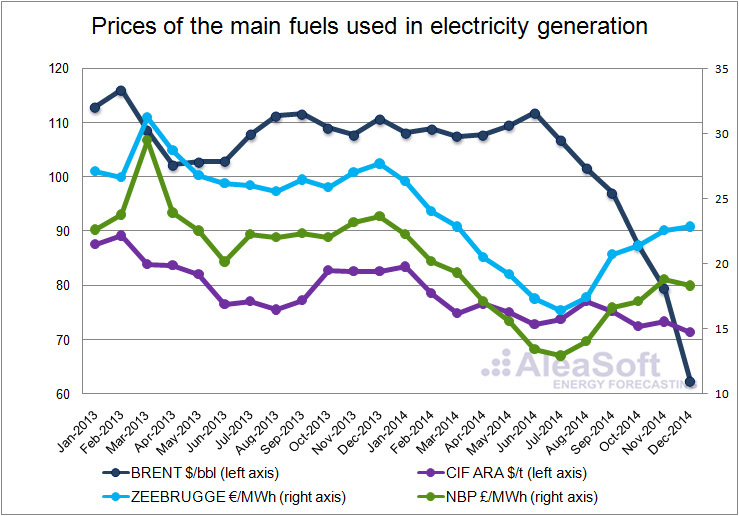 The average price of 2014 in this market was 32.76 €/MWh, 5.02 €/MWh lower than in 2013. In the N2EX market in UK, the year-on-year drop in 2014 was 6.86 €/MWh, with the price of 2014 at 52.22 €/MWh. In the first half of the year the largest decline over the same semester of 2013 was recorded, which was 8.90 €/MWh, while in the second half the price was 4.86 €/MWh lower when compared with the same period from the last year (the average price for the first half of 2014 was 51.41€ /MWh and the second 53.01 €/MWh). For the Italian IPEX market, the PUN price stood at 52.08 €/MWh in 2014, being 10.91 €/MWh lower than in 2013. The month with the highest annual decline was July where the price was 20.44 €/MWh lower, at 46.42 €/MWh. 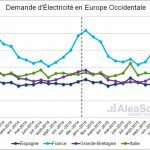 AleaSoft expects that in 2015 the prices of major European electricity markets will continue to fall due to the forecasted fall in prices of fuels for power generation. A greater fall in the IPEX market in Italy and EPEX SPOT-Phelix market in Germany and Austria is expected. The average price of Brent crude oil fell $9.63 in 2014. The most significant decline occurred in the second half of the year when the oil price reached $19.82 below the market value that this fuel had in the first half of this year, in which prices had remained stable around the average value of 108.93 $/bbl. The fall in the price of a barrel of Brent is mainly due to the increase in overall production, mainly from the United States, and the refusal of OPEC to cut oil production. CIF ARA coal, the European benchmark, continued in 2014 the descent path it had held for most of 2013. The average price per ton of coal last year was $75.35, $6.34 less than in 2013. The price of gas, both the Zeebrugge gas as the NBP gas, decreased continuously during the first half of the year until August when it began to pick up. The average price of Zeebrugge gas in 2014 was 20.95€/MWh, 6.14 €/MWh less than in 2013 and in the case of NBP gas, it was 17.12£/MWh, 6.03 £/MWh less than in the previous year. Sources: CIF ARA – EEX, BRENT – EIA, ZEEBRUGGE – NetConnect Germany, NBP – ICE ENDEX. The forecast scenario of fuel prices used by AleaSoft suggests that Brent oil and coal CIF ARA prices will suffer significant declines in 2015, while only a slight decline in Zeebrugge and NBP gas prices is expected. The average price of CO2 emission rights in 2014 was 6.01 €/t, which meant an increase of 1.49 €/t compared to 2013. 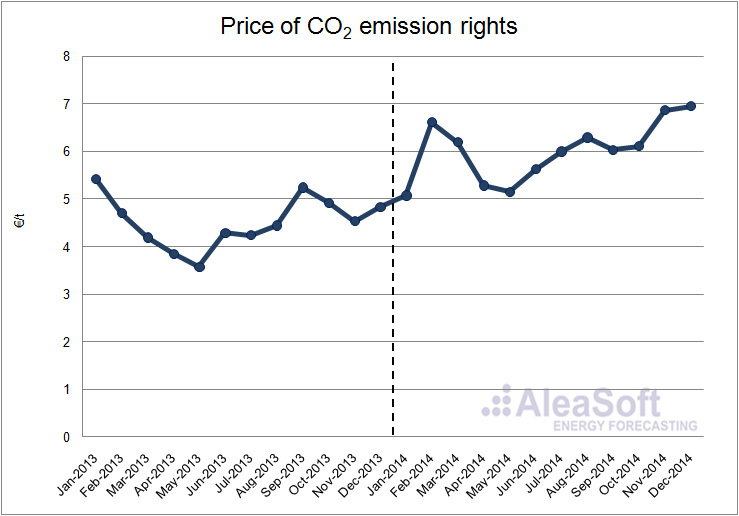 AleaSoft expects that in 2015 the CO2 emission rights price will increase compared to last year recorded values.